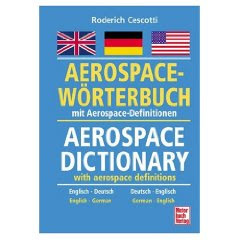 Although we've got a rather extensive library of German/English translation dictionaries and other reference works, I haven't been satisfied with its coverage of aerospace topics. Up to now the best I've had has been a Lufthansa dictionary and a bunch of general technical ones (the infamous Ernst and a dozen others). Then I found a copy of Roderich Cescotti's Aerospace Dictionary with Aerospace Definitions in an online auction. The price was right, so I thought I would risk a few euros. On Amazon.com the book sells for USD 125; one vendor there offers a copy for nearly USD 300. The regular price on Amazon.de is about 95 euros (around USD 140 at current rates). It finally arrived today. I was pleased to see that the content is tagged according to subfield; if this dictionary had been on my shelf last summer when I did a big translation on helicopter canopies, all the helicopter-relevant terms would have been clearly labeled as such for my convenience. The first half of the dictionary is a decent DE>EN and EN>DE dictionary like most. The second half has both German and English monolingual sections which give detailed explanations of individual terms. We can't all be aerospace engineers, and this is very useful to help me understand some of the concepts. If a term listed in the first half of the book has a definition in the second half, this is indicated in the dictionary entry. The dictionary isn't cheap as noted above, but it's a worthwhile investment if you do work in this area. It's even more worthwhile if you get it cheaper, which you can. I paid about 20 euros on eBay.de for it, and I see many copies of it there listed regularly on the German eBay site (eBay.de), most at a "Buy it now" price under 40 euros that includes shipping.